Building indemnity insurance is taken out by a building work contractor when performing domestic building work (including landscaping) that requires council approval. 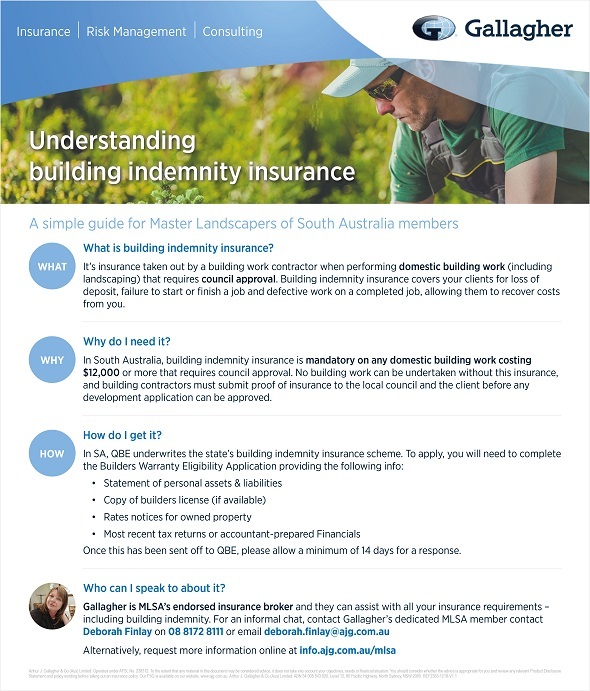 In South Australia, building indemnity insurance is mandatory on any domestic building work costing $12,000 or more. It covers your clients loss of deposit, failure to start or finish a job and defective work completed on a job, allowing them to recover the costs for repairs or completion of works from the insurer. Gallagher is MLSA’s endorsed insurance broker, and they are here to help you understand building indemnity insurance. For an informal chat, contact Gallagher’s dedicated MLSA member contact Deborah Finlay. Click here to find out more about Builders Indemnity Insurance.